When it comes to cleaning home interiors and exterior outlets, decks, cars, and even trucks, efficiency are of the essence. If you want to do a perfect job cleaning grime, grease, and gunk from surfaces within the shortest time possible, an Electric Pressure Washer is all that you need. These machines are very affordable, eco-friendly and very efficient compared to the gasoline-powered varieties. The following are some of the least expensive, yet efficient Electric Pressure Washers you may want to check out while shopping. Call it the ultimate dirt fighter! 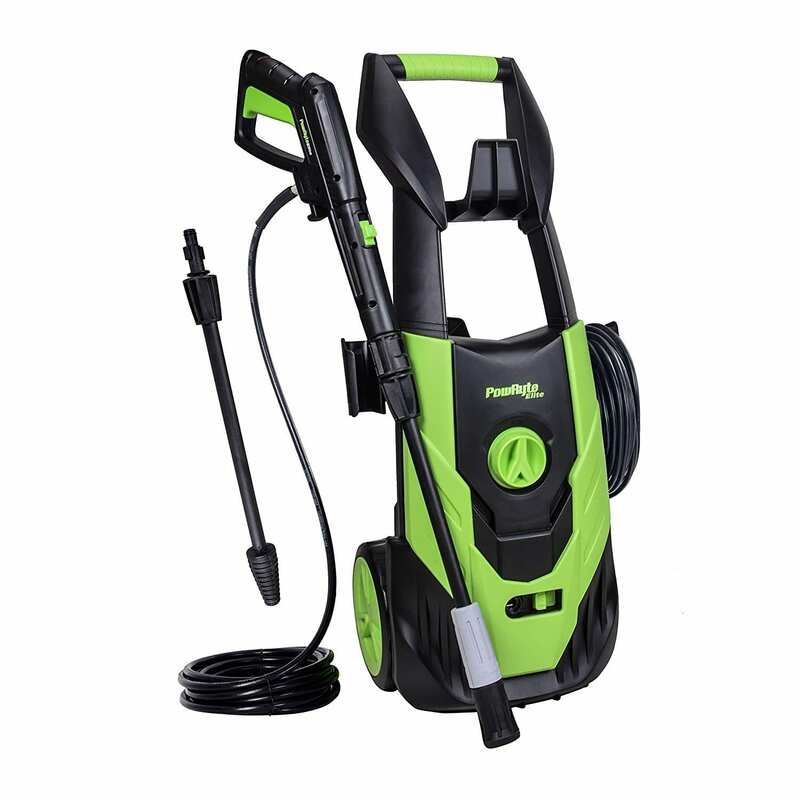 If you are seeking an ideal way to clean up your patio, deck or any exterior outlets, try out Moroly Electric Pressure Washer. With a water pressure of 3000 psi/ 1.8 GPM, this washer blasts out all kind of dirt, oil, rust, and even grease on surfaces. It is equipped with a Total Stop System (TSS) that automatically shuts down the pump whenever the trigger is not engaged. 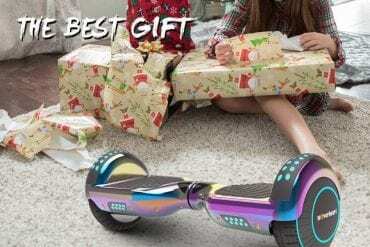 For ease of use and maneuverability, it has a 33ft long power cord. It even has a soap applicator that works in sync with the spray gun so you don’t have to interrupt your cleaning to apply soap. With up to 5 interchangeable nozzle tips, this Electric Pressure Washer is ready for all kinds of dirt. These tips vary the pressure of the water jet depending on the nature of the cleaning task; light wash, intermediate wash and heavy duty clean. 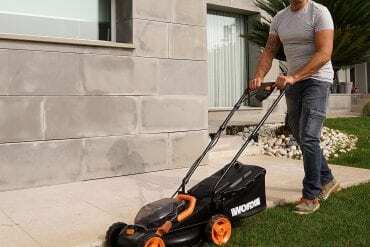 It has a convenient lightweight design featuring wheels and a 6m high-pressure hose. It is therefore very ideal for use on most exterior outlets. It is very easy to put together assemble. 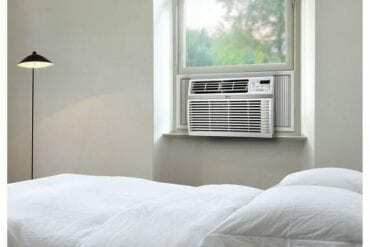 Eco-friendly and very energy efficient. It uses 80% less water and conserves up to 40% power. It is multifunctional and fits a wide range of pressure washing options for homes, garage, and even vehicles. This Electric Pressure Washer has an integrated TSS that automatically shuts down the pump whenever the trigger isn’t engaged. This helps improve longevity and also saves on power. Generates water jet pressure of up to 3000psi/ 1.7GPM, strong enough to dislodge any dirt, oil or grease from surfaces. A soap applicator ensures uninterrupted cleaning. 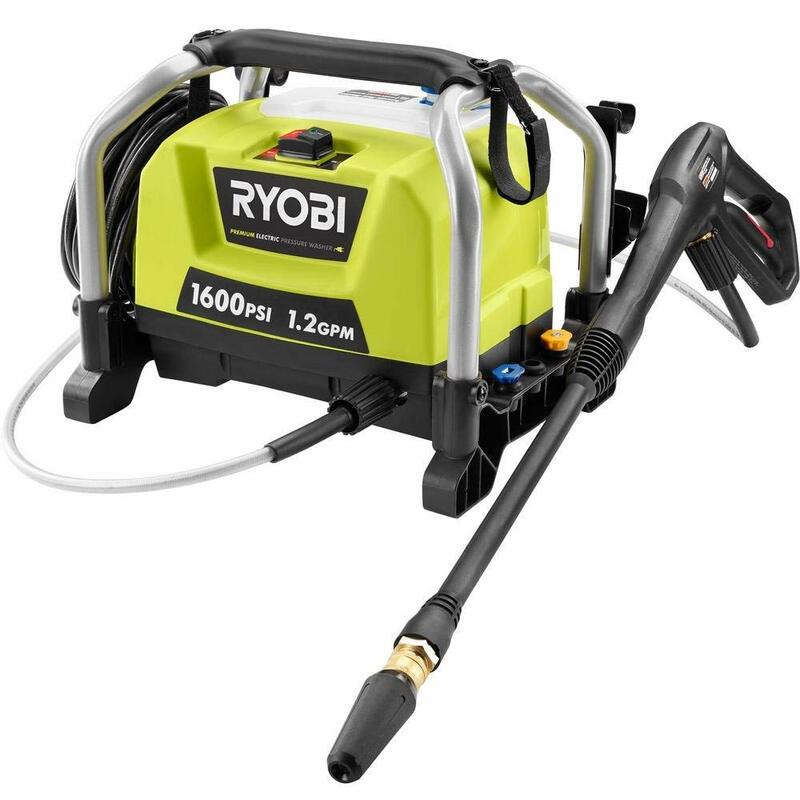 Portable and efficient, the Ryobi 1600 psi 1.2 GPM Electric Pressure Washer is PWMA standard approved. Complete with an onboard detergent tank housed in a rugged roll-cage, this washer makes otherwise time-consuming and stressful cleaning tasks fun and easy. 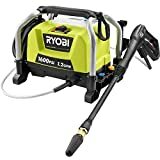 It is capable of pressure jets of up to 1600psi at a flow rate of 1.2 GPM making it ideal for normal household cleaning and washing various exterior outlets. For extra cleaning potential, the Ryobi Electric Pressure Washer has a bonus Turbo Nozzle that delivers up to 50% more cleaning power. Its universal induction motor delivers water pressure up to 1600psi, ideal for household cleaning, washing various vehicle models, driveways, etc. Has a 3-year warranty coverage. It is built strong and durable. 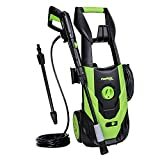 You want an easy to use, affordable, and efficient washer to help with cleaning grime and dirt must be the Greenworks Electric Pressure Washer. With up to 1500psi in water jet pressure and a flow rate of 1.2 GPM, this machine is ideal for normal household cleaning in patios, decks, kitchen, and exterior outlets. 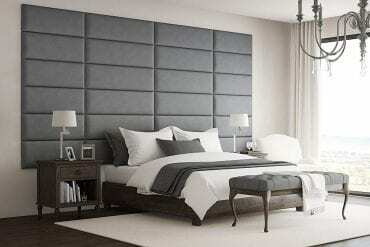 It allows for both horizontal and vertical manipulation during cleaning. 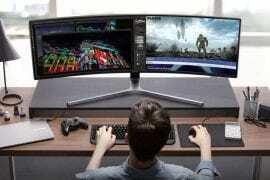 This ease of maneuverability makes the cleaning thorough and targeted. It comes with 2 quick nozzle tips; 25° and 40°. These allow for effective cleaning of surfaces by regulating the spray jet pattern and pressure. For greater reach during cleaning, this washer comes with a 20ft high-pressure hose. The hose which is equipped with an M22 threaded twist for easy maneuverability and durability. This washer even has a soap applicator, so you don’t have to interrupt cleaning to apply soap. Water spraying and soap application all happen synchronously. Has a 20ft high-pressure hose that allows for cleaning on elevated surfaces and surfaces a short distance from the power source. Equipped with a 25ft high-pressure hose, turbo nozzle, and a detergent tank, the Briggs & Stratton Electric Pressure Washer rips through dirt, grime, grease, and gunk with incredible ease. Unlike other models, this one is relatively quiet while in operation. 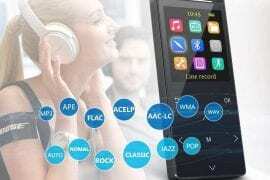 That minimal noise pollution is good for your ears. It also automatically starts and stops depending on the level of engagement of the trigger on the spray gun, thanks to the Total Stop System (TSS). This pressure washer is equipped with a detergent foam maker that lathers the detergent giving you a very clean wash. It comes equipped with a turbo nozzle that makes your cleaning very energy efficient and also saves you time. This Electric Pressure Washer is up to 40% faster than the standard spray washers. It is also very adaptable and versatile, thanks to its 3 spray tips; 15 degrees, 40 degrees, & turbo. These tips are easy to switch between cleans depending on the task at hand. A 35ft long electrical cord and a 25ft high-pressure hose make it fun and easy to clean both near and distant surfaces. With a water pressure of up to 2200psi and a flow rate of 1.2 GPM, you easily blast dirt from surfaces on or near the ground or even relatively elevated heights. Up to 3 task-specific spray tips; 15 degrees, 40 degrees, and turbo. Has a detergent former that makes your cleaning simple and uninterrupted. It also uses less soap. 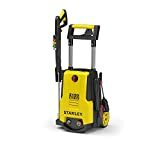 The pump of this Electric Pressure Washer consists of a durable brushless induction motor that operates with minimal noise. It is ideal for cleaning indoors and outdoors. For extra firepower to dislodge tough grime, just attach the Turbo Nozzle. It is tested and certified by the Pressure Washer Manufacturers’ Association (PWMA). You want to get rid of grime, gunk, oil, rust, etc. from any type of surface, be it vehicle, car, truck or just the ordinary household dirt, this washer is all you need. It’s specially designed for quick outdoor cleaning tasks, but also does well cleaning your patio. With a water pressure of 3000psi and a flow rate of 1.8 GPM, excellent performance is for sure. It supports a wide range of cleaning solutions that fit the needs of any homeowner. It is very easy to switch between low and high-pressure water jets while cleaning. This makes it very simple and direct to restore surfaces. For better stability during operation, this Electric Pressure Washer supports both vertical and horizontal positions. Up to 5 interchangeable nozzle tips are also available. These tips allow for easy pressure regulation depending on your cleaning task. To further your reach while cleaning, this Electric Pressure Washer comes with a 10m long power cord. With such a long power cord cleaning exterior outlets is simply fun. It also comes with an onboard soap applicator to ensure your cleaning is quick and uninterrupted. Ideal for cleaning home interiors and exteriors, cars, decks, boats, etc. Comes with a 6m long high-pressure hose and a 10m long power cord to further your reach while cleaning. Has an integrated soap applicator for an uninterrupted wash. Supports horizontal and vertical adjustments for extra comfort and maneuverability while cleaning. Comes with up to 5 interchangeable low and high-pressure nozzles. You can easily switch between these tips depending on the cleaning task at hand. 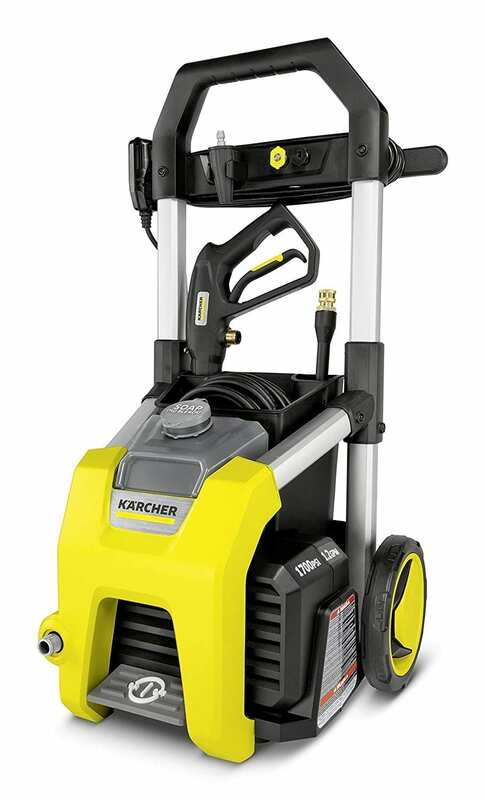 Powered by a reliable brushless universal induction motor, the Karcher K1700 Electric Pressure Washer is built for an unmatched cleaning performance. With a water pressure of 1700psi, this washer removes grime and gunk with unparalleled precision giving surfaces a clean sparkle. Unlike most washers, this one comes with a handy storage bin where you put in your cleaning gears like gloves, nose masks, etc. 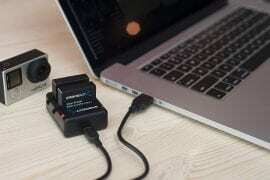 A foot switch makes it easy to regulate power consumption during cleans. Three sets of nozzle tips come in handy depending on the nature of your cleaning task. The turbo nozzle is ideal for high-pressure intense cleaning tasks. In addition, it has oversized wheels for easy movement while cleaning. 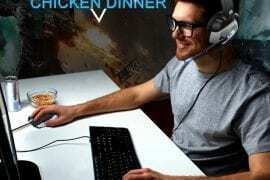 All these components are encased in a high-quality aluminum frame for durability. This washer requires basic assembly before use. It is important to note that the setup process requires no tools whatsoever. Just fitting in the hose, spray gun, and switching between various nozzle tips. Uses multipurpose as well as vehicle detergents. It is best for patios, driveways, terraces and other hard surfaces. Has a 50ft kink-resistant high-pressure rubber hose that allows for the furtherance of your cleaning range. Comes with a water-pressure driven rotating brush to help remove stubborn dirt and grime. The multipurpose and vehicle detergents are all biodegradable. These detergents are best for cleaning exterior outlets and vehicles respectively. It has ¼” quick connect adapters and M22 threaded connections for the rubber hose. With spray nozzle tips capable of adjustment from 0 to 40 degrees, the PowRyte Elite Electric Pressure Washer is for sure a top performer. At a flow rate of 1.8GPM, this washer is capable of delivering water jet pressure of up to 2100psi, high enough to remove the most stubborn grime and gunk. It comes with a 20ft high-pressure hose and a 35ft power cord that is GFCI-protected for unlimited range access. The spray gun trigger also automatically starts and stops the pump when the trigger is engaged or disengaged respectively, thanks to the inbuilt Total Stop System. An onboard detergent tank makes it ready for cleaning at a press of the trigger. 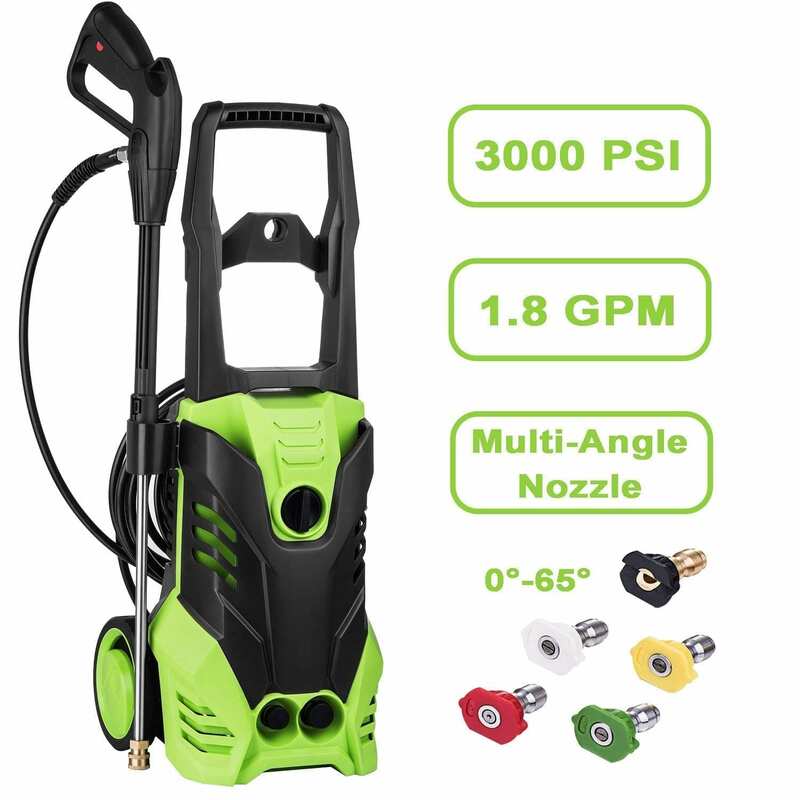 In addition to its adjustable spray nozzle tips, this Electric Pressure Washer also has an extra Turbo nozzle that has a “pencil point” jet that is capable of 360-degree rotations for that impeccable wash.
Has adjustable spray nozzles capable of 0″ to 40″ rotation for low and high-pressure wash respectively. It is equipped with a Total Stop System (TSS) that automatically shuts off the pump whenever the trigger is not engaged. 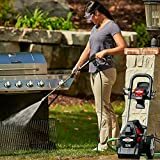 Has a 20ft high-pressure hose and a 35ft power cord allowing for easy maneuverability and furtherance of range while cleaning. If you are looking for a washer that is best suited for tough grime, grease, rust, and gunk, you can never go wrong with this one. It comes with an onboard detergent tank which doubles as foam maker. 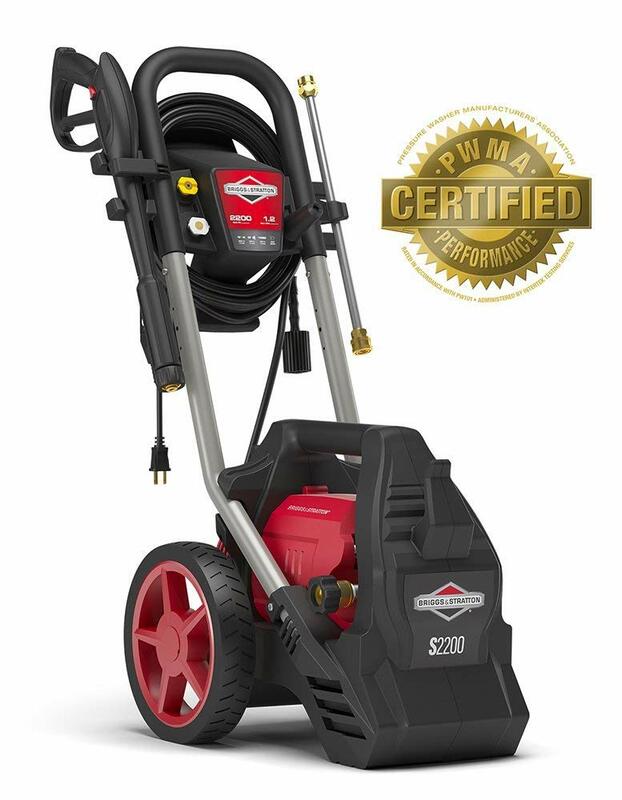 With a water pressure of 2150psi, this Electric Pressure Washer delivers a powerful cleaning force best for decks, cars, trucks, pavements, patios, etc. 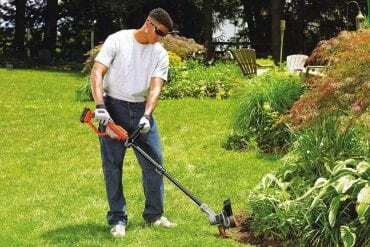 It comes with leak-proof brass garden hose adaptor for quick and easy connection of the high-pressure garden hose. It comes with an onboard detergent tank that also features a foam cannon. For maneuverability and ease of use, this washer has a 25ft high-pressure hose. 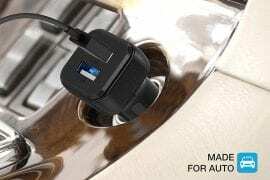 Other additional components include a spray gun that delivers powerful water jets, 4 quick-connect nozzle tips for different cleaning operations. Comes with other easy fix accessories; 4 quick connect nozzles, spray gun, zinc steel lance, and an O-Ring replacement kit. 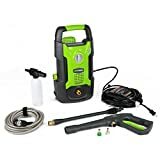 Comes with brass garden hose adaptor for quick and easy connection of the high-pressure hose to deliver the pressurized water to the spray gun. This is by far one of the best rated Electric Pressure Washers in the market. With a water pressure of 2000psi and a flow rate of 1.4GPM, this washer spares no dirt or grime. Its efficiency is what gives it an edge over other standard washers; it uses 80% less water for an outstanding wash. It offers two main spray options; the 25-degree “fan spray” and the 0-degree “pencil point” high-pressure spray. Various nozzle tips are available to support these spray options. For instance, the green nozzle tip is specially designed for the fan spray while the red nozzle tip supports the pencil point high-pressure spray. The black tipped nozzle only sprays the detergent. 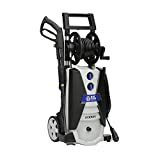 This Electric Pressure Washer is certified by CSA for international safety standards, not many washers are approved by this international body, so you can be sure this one is very exceptional. 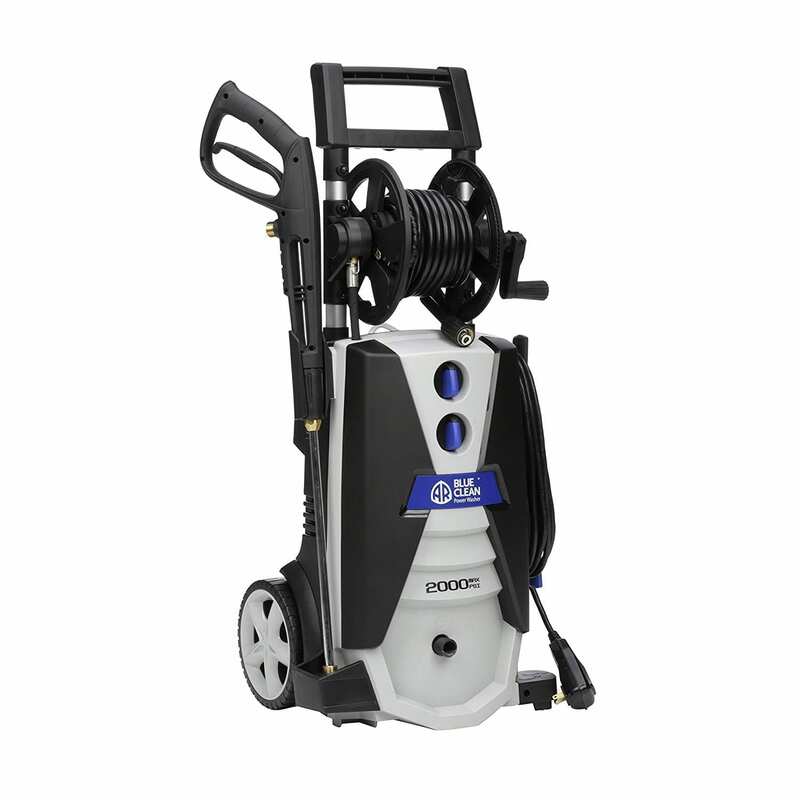 It is lightweight, quieter and easy to use compared to the ordinary gasoline pressure washer. It is ideal for medium and heavy duty residential cleaning as well as cleaning at the workplace. Has 3 nozzle tips; black for detergent; red for pencil point spray and the green tip for fan spray. Has a 30ft hose and a 35ft power cord for a greater cleaning range. Has an integrated Total Stop System that automatically shuts off the pump whenever the spray gun trigger is not engaged. The Sun Joe SPX3000 Electric Pressure Washer offers a mix of performance, power, and versatility for an unparalleled clean. 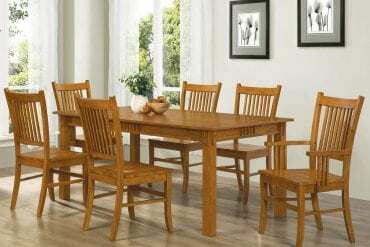 It is best suited for a variety of cleaning tasks ranging from home patios, decks, boats, cars, trucks, etc. It is capable of water jet pressure of 2030psi at a flow rate of 1.76 GPM giving that unstoppable cleaning power. This is one of a few washers with a detergent selection dial. This dial selects from the available detergents in the 2 onboard tanks. This makes cleaning dirt, grease, gunk, and grime from surfaces a very simple task. It is also equipped with a 34-inch extension spray wand and wheels that makes it very easy to clean hard-to-reach places. A set of 5 spray nozzle tips make it very easy to tailor the jet pressure in line with your cleaning task. 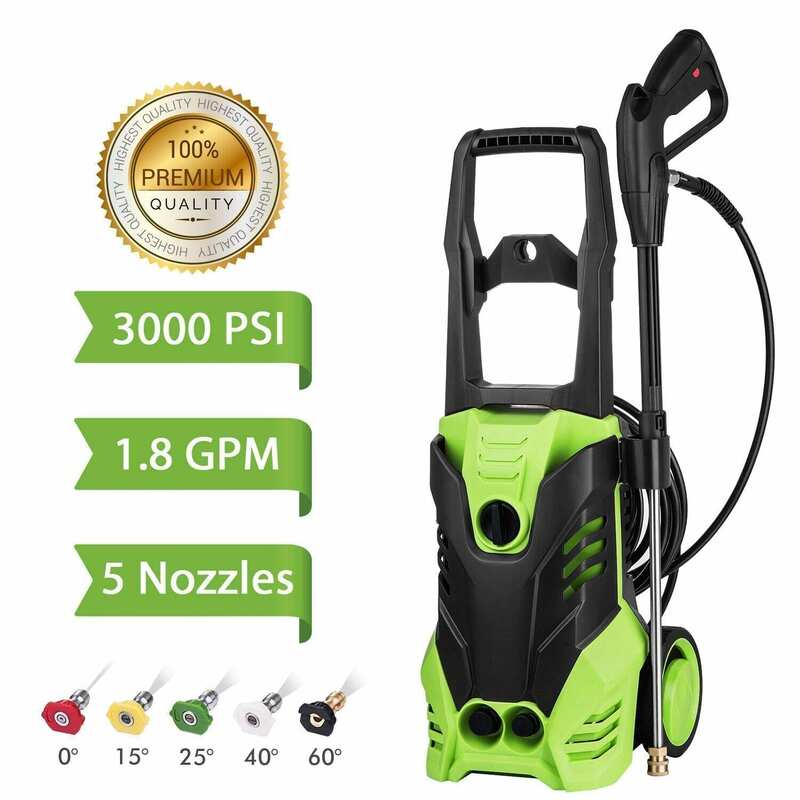 To further enhance efficiency, this Electric Pressure Washer comes with a 20ft high-pressure hose and a 35ft power cord. Has two onboard 9L detergent tanks. Comes with rear wheels. Together with its 20ft high-pressure hose and the 35ft power cord, this Electric Pressure Washer allows for great maneuverability. A water pressure of 2030psi at a flow rate of 1.76GPM delivers enough power to rip through the toughest of stains, grime, and even grease. Has a set of two 9L onboard detergent tanks that makes it easy to switch between detergents depending on the task at hand using the detergent selection dial. It has a set of 5 spray nozzle tips. You can easily switch between the different types depending on the cleaning task at hand. Finding an ideal electric pressure washer that fits one’s particular cleaning needs can be a real challenge. This is particularly because of the many brands available in the market today alongside numerous counterfeits. 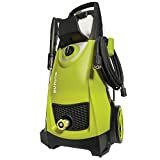 This review has elaborately detailed the leading brands of electric pressure washers, their features, and the associated pros and cons. 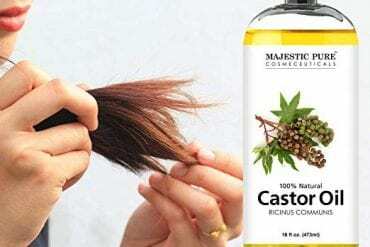 The info we have provided here is sufficient to help you get the best product. Use our shopping guide to purchase genuine, high quality, and affordable washers from Amazon.